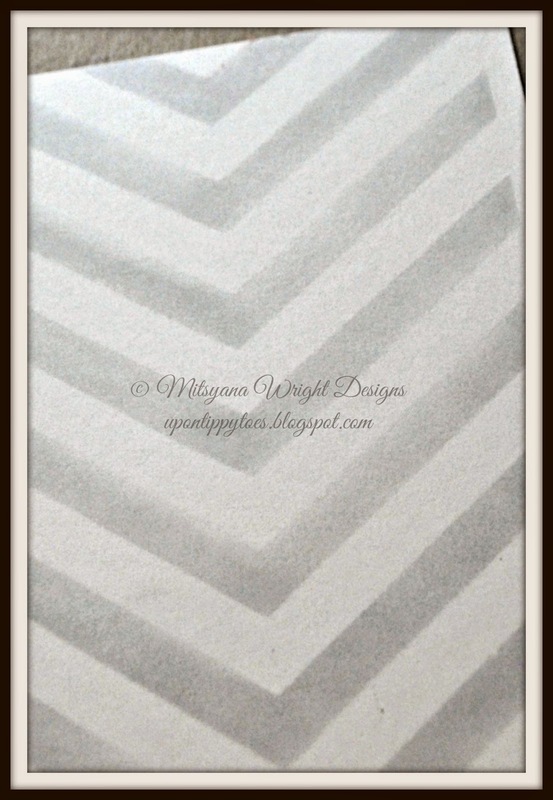 I just love that Mitsy has designed a very lovely yet masculine card for Valentines' Day. I love her crisp designs. I am going to follow her lead for my husband's card. Hey eBrushing friends... Today I have 2 cards to show you. As we all know Valentines Day is fast approaching. And, if you are like me it's very hard to find card that appeal to your male counterpart. Most store bought cards are frilly or cutesy, doused with glitter, and mostly attract the female eye. So, this year, why not try making your own Valentines Day card for that special guy in your life. 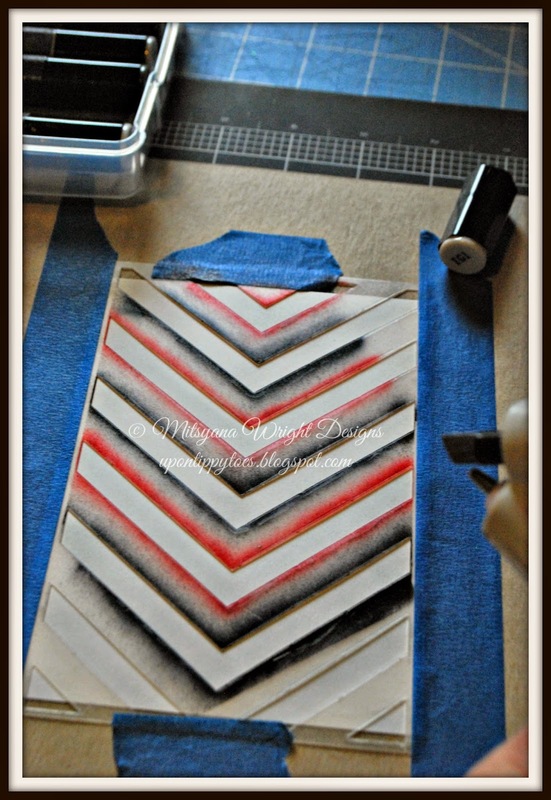 I started by ebrushing my pattern onto my white cardstock with my Studio Calico Mask and Spectrum Noir Marker in IG1. I used blue painter's tape around the edges of my paper to secure in place. I chose very masculine colors for my card. Shades of grays, black, and metallics. I chose the lightest shade of gray I had for my background. I did this for two reasons... 1) I didn't want it to be too stark and overwhelming against the white, and 2) If it was too light I could simply layer the color on until I got to the shade I wanted... remember, you can always add but it is very hard to take away! One I ebrushed my background and matted it onto black cardstock I notice it needed a little extra something... 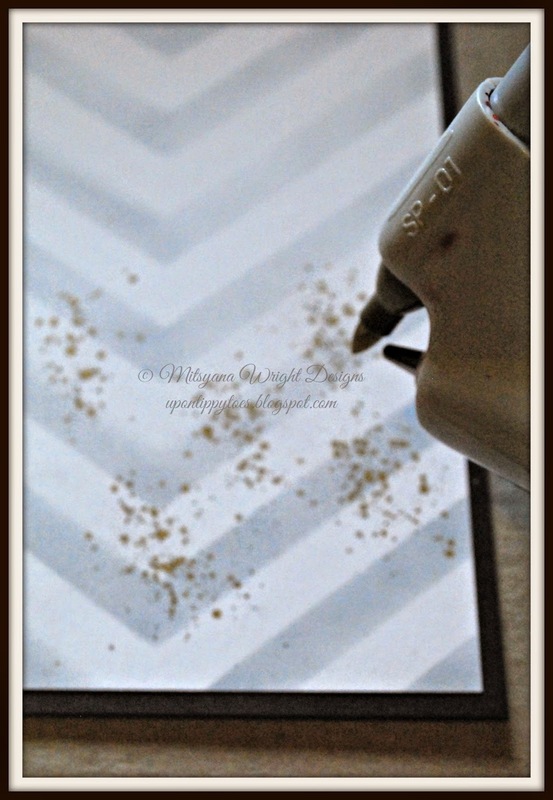 I simply ebrushed a few "splatters" with my metallic gold Sharpies. 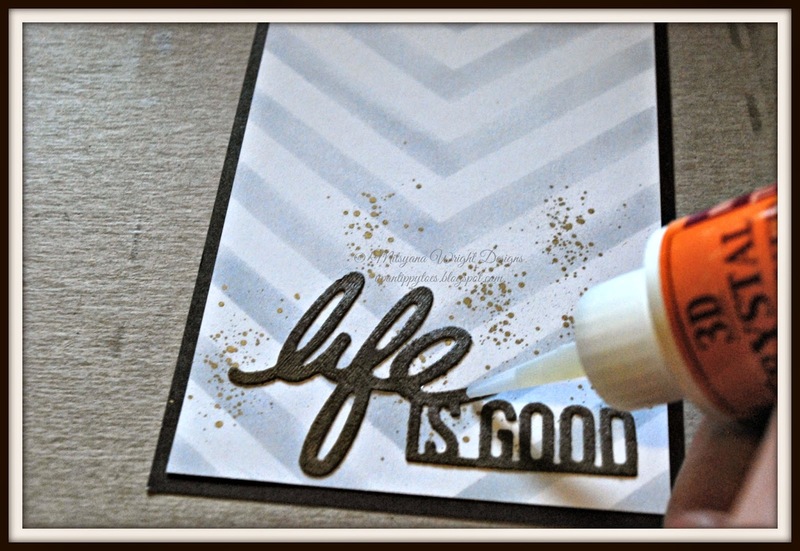 Then I cut out this phrase from my Teresa Collins Pocket Dies and personal die cut machine. I ebrushed the top half with my silver Sharpie and the bottom with gold. I then adhered it to my card front. Again, something was missing, it seemed too flat to me... so, I added 3D Lacquer directly to my die cut phrase. 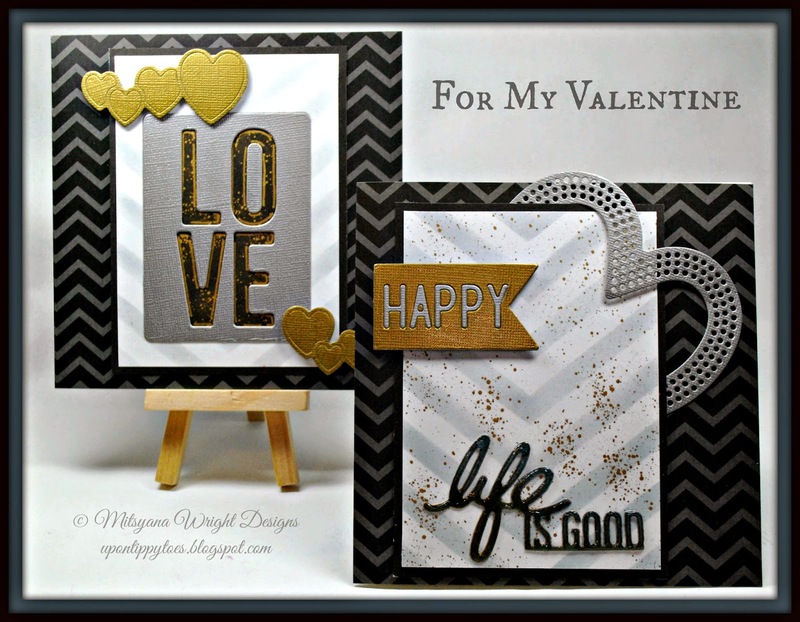 I also cut out a heart frame and "happy" flag and glued everything to a 6"x6" card I made from black and gray chevron paper. I loved this color scheme an layout so much I decided to make a second card. Same color scheme, same layout, different dies. 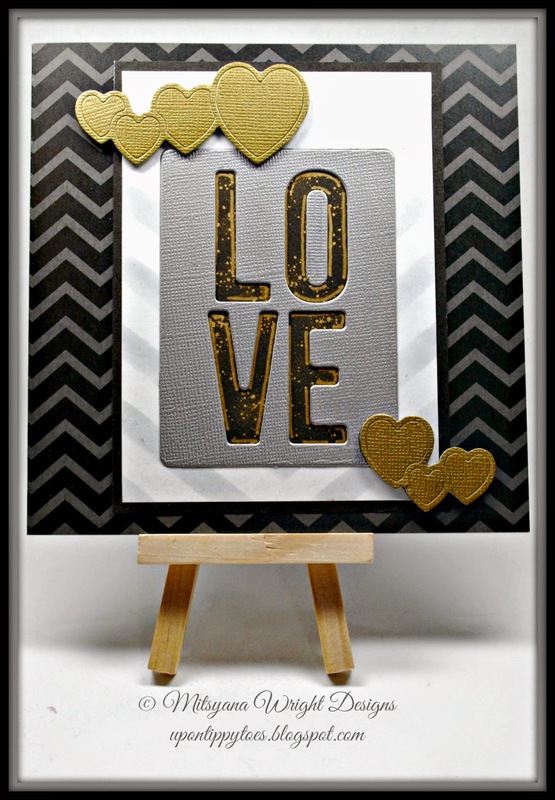 Here I used more Teresa Collins Dies.. from the same set , Lovers' Lane, and made an additional card for my sweetie. And here are my finished Valentines Day cards. I hope the hubster loves them as much as I enjoyed making them! 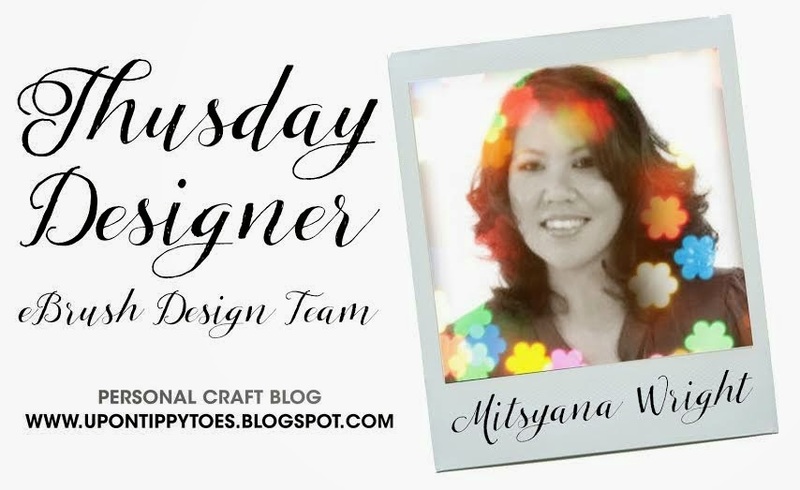 To see more of my crafty projects please visit my personal blog here! 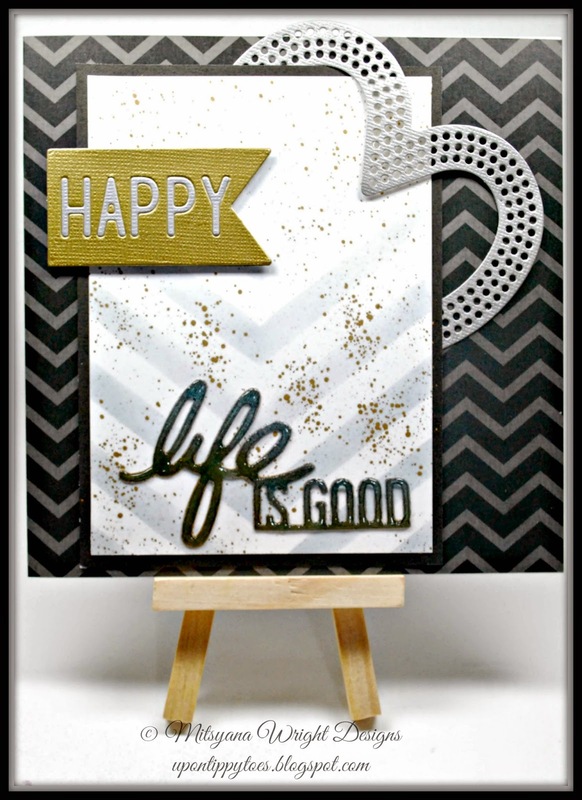 Beautiful cards, I love the added, "splatters". Fabulous cards!!! Love the details.